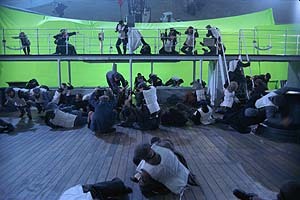 The anatomy of one of TITANIC's huge effects shots. This is just one of Digital Domain's extremely complicated shots from the sinking sequence. These two stills are frames from the greenscreen photography. 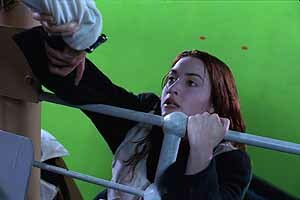 Notice the reference markers behind Kate Winslet, which are used to assist match-movers in tracking the footage. 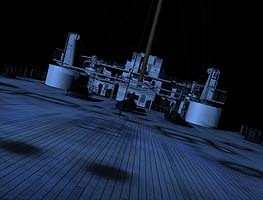 The right image was photographed with the full-scale poopdeck set pitched at a severe angle. Notice the dry land behind the greenscreen. 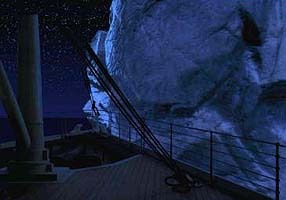 At left is the CG Titanic created by DD in Lightwave by its NT group, which was used extensively in set extension shots. 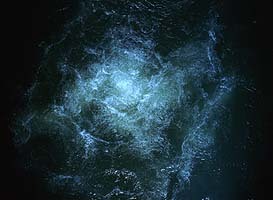 At right is an example of the 'miniature' water and foam. 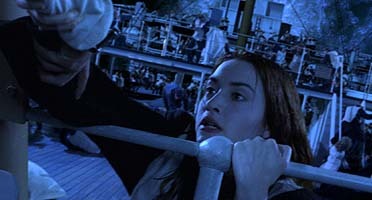 With a great deal of 2D massaging, blending the live-action elements with the CG boat, tracking the wild camera move, re-lighting the elements to match Cameron's trademark 'blue' monochromatic night lighting, as well as integrating CG stuntmen, the complicated shot is complete. All of Digital Domain's set extension shots contained these basic elements. 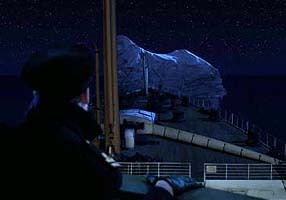 The iceberg approach shots were completed with a complex combination of the miniature Titanic, digital water, greenscreen elements, and a miniature iceberg. Digital Domain shot all the elements, which were composited by LightMatters/Pixel Envy.